We are privileged to live in a country where we have shelter, clean water, food on the table, and we get to enjoy all the freedoms that the US Constitution provides. It’s easy to take all these things for granted and to forget that so many around world do not have a roof over their head, access to health care, or the right to vote. But all too often, we focus on things not going on our way that are trivial, even letting them ruin our mood and feel compelled to share “our misery” with others. “Headphones died in the middle of a work out! So upset and annoyed!”, read on FB recently. Someone chimed in, “THAT IS THE WORST. EVER.” in all capital letters. Hmmm….really?! The Starbucks drive through line is too slow. Harris Teeter does not carry a favorite brand of Greek yogurt. You get what I am saying. Practicing gratitude and focusing on all the abundance that surround us can change our mood, our day and possibly our life. Gratitude is what makes the glass full; it reminds us that we have enough and that we are enough. The way we can change our thinking, making us realize how fortunate we are, even when we feel down. The most meaningful gifts are the ones that cost very little or nothing but come from the heart. I have been fortunate to receive several Gratitude Jars over the years, and I encourage you to either give them as gifts during this holiday season or create your own for yourself. Its simple; just find a mason jar, perhaps put a ribbon around it or make it as fancy as you like, thank you, Pinterest! Then either fill it with blank slips of paper if you give it as a present or make one for yourself to keep and write down something that you are grateful for each night. At the end of this coming year, take the time to read all that makes our life wonderful and worth living. As Thanksgiving gets closer and our thoughts turn to all the things are thankful for I have asked one of our teachers, Gretchen, to share her thoughts on gratitude. Thank you, Gretchen! In August of last year I was inspired by a friend and mentor to begin each day with gratitude. Nearly every morning since then I start my day with a gratitude practice. I keep it simple so that I can commit a consistent practice. When my alarm goes off I hit snooze and during those precious minutes before the next buzz I go through a list of things I am grateful for. I say them to myself but you could also say them out loud. You could journal them, if that is your thing, but keep the practice simple. Consistency is more important than complexity. Setting your smart phone screen image to something or someone you are grateful for. Incorporate a word that reminds you of gratitude into your computer password. The holidays inspire us to pause and give thanks for the blessings in our life. What if you used one of these daily tools to take that gratitude and weave it through out the year? Thank you for being part of our amazing community, you are one of the things I am very grateful for. One of our yoginis, Susan Quilty shares her thoughts on the value of learning new things and, in turn, learning about yourself. Thank you, Susan! In Northern Virginia, Autumn brings two special things: pumpkin spice everything, and a new group of students to IPY’s yoga teacher training. It’s been two years since I began my own teaching journey and it’s amazing to stop and consider how that experience has changed me. My decision to sign up for teacher training at IPY was partly driven by fear. I’d reached a point where I was no longer content in my career. It was time to make some changes and I knew those changes would include risk and inevitable rejection along the way. What I wanted to do was clear, yet I was stuck in fear and too afraid to move forward. Since my yoga practice had already helped me in so many ways, I decided to bring yoga into my career plans as well. If I could face the fear of teacher training, and the much larger fear of stepping in front of a class to put that training to use, I was sure that I would be ready to face anything. When training began, I expected to learn about anatomy, yoga philosophy, and how to lead a vinyasa practice. I was not prepared for how much I would also learn about myself. Throughout training, we kept coming back to the idea of finding our own authentic voices. We learned to discover—and appreciate—what we each had to share as teachers. This idea, as simple as it may sound, was a revelation. I had something of value to share that was individual to me. The true value of my teaching was not in leading a flawless class, but rather in sharing something of myself, and my experience, along the way. Now that I’ve been teaching regularly for some time, I’ve discovered that leading a class requires a balance of vulnerability and confidence. I’ve learned to consider feedback with a willingness to improve, but without the compulsion to fit someone else’s ideal. I’ve found the courage to move forward and take chances to reach my goals. In short, teaching yoga has taught me not only to face my fears, but to accept myself and value what I have to offer, both in and out of the studio. One of our wonderful yoginis, Jennie MacGoy, shared her experience with yoga and the benefits it has brought to her life. Thank you for sharing, Jennie! If you Google the word “hypochondriac,” my picture appears. I’ve spent almost 19 years cultivating this feat while raising four children. Sore throat: gonna be strep or influenza. Little stomach ache: full-blown stomach bug must be around the corner. A slight headache: get ready for a 103 degree fever. This is what my brain has done every single time one of my children has a bodily ailment. Not fun. Not healthy. Very stressful. But it’s what I do. 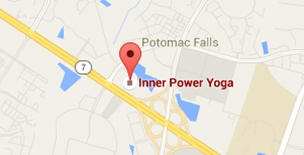 I’ve been practicing vinyasa yoga at Inner Power Yoga for a little over one year. Why did I try yoga? To bring some peace to my overactive, worrying brain. Over time I found that I could melt into my mat and feel at peace. What an accomplishment! However at home I always reverted back to what my brain had done so well for almost 20 years: worry about what might happen next. It’s as if I have two brains: one that is good at focusing on the breath and being mindful at the yoga studio; and one that goes haywire when one of my children doesn’t feel 100 percent well at home. Just call me Dr. Jekyll and Mr. Hyde. It’s nice to meet you. Last week, my youngest complained of a mild sore throat and headache at bedtime. As usual, my brain went into hypochondriatic overdrive: “This is going to be morph into a major illness; I think her head feels hot; I think my head feels hot; this is going to be a horrible night.” But then I stopped. Truly stopped in my tracks. I closed my eyes and I focused on my breath. I felt the cool inhales and warm exhales. I heard my yoga teachers in my head saying, “Just breathe,” “If you aren’t here, you’re nowhere,” “I am here, this is now.” And I calmed down. While I didn’t know how the evening was going to progress, I knew at that moment, things weren’t too bad. And that moment was what I focused on. My body and my brain felt at peace. It was beautiful. I share this story because I want others to know that the practice of mindful breath and movement — the beautiful practice of vinyasa yoga — can have an incredible impact on your mental health off the mat. Consider how you might channel your mindful breath and sense of peace during stressful (even irrational) moments in your life. The effects can be life changing. Our wonderful teacher, Anya, recently went on an trip to Ireland. She blogged about her adventure and I asked her to share some of the things she learn on the way. Thank you, Anya! In early August, I traveled to Ireland. I wrote a blog post about the experience: 10 Things I Learned in Ireland. In addition to those 10 things, I was reminded of 3 other “things” that I think are good to share with my people at IPY. 11. It’s important to travel. Obvious, sure. But if it’s financially possible to travel far from home and from what feels comfortable, do it. It’s good to be at the mercy of the travel gods, forced out of your routine and compelled to take moments as they come. It’s also good to be around people whose backgrounds and world-views and priorities may be completely different from or outside of your own. It’s humbling, really. We, humans, do share in an experience: the world as it currently exists. When I imagine that experience, I envision something that looks sort of like abstract art…a canvas on which the artist has pinned thousands of multicolored threads, each disparate and pulled taut, but crisscrossing and overlapping to create something that feels full. It is good to put ourselves into circumstances that require interaction – crisscrossing – with someone we’ll likely never see again. And if you can’t travel far, travel close. Drive somewhere or use public transit to stretch beyond your usual boundaries and commute. A conversation with a stranger in a community that might not be your own is a great way to expand upon and challenge what you think you know to be true. 12. Try something scary once a month. Or week. Or day. Trying something that feels flat out SCARY can prove how much we’re actually capable of. There are many examples of this on the mat when we take physical yoga asanas: leaning super far forward in an arm balance when it feels, surely, that your face will plant into and through the floor; going upside-down; balancing on one leg. And, often, when there is no yoga mat near, we’re still able to practice creating and keeping a settled mind – the mental way of being that a yoga practice helps to teach – when we’re doing things that feel scary, like traveling: getting on an airplane; driving on the other side of the road; hiking up a 14,000-foot mountain or down into a gorge or valley that’s beyond the scope of GoogleMaps. Rise above your mat. Step off the road. Trust. 13. Keep the exhilarating feelings of travel with you when you’re back into the ‘normal’ routine. Yeah, this takes some practice. Since I returned from Ireland, it has been really hard to come back to…work. To responsibilities. Once you’ve reconciled with and accepted and enjoyed the things that felt scary, it’s tough to move into a week where everything feels…basic. Mundane. So then it becomes about a choice – choosing (or at least actively trying) to appreciate things that feel much less exciting. I find that my physical yoga practice really helps with this: we focus in on the tiny stuff like the sound of one breath, the feeling of the texture of the mat, on one bead of sweat moving down the face or arm. This focus on the tiniest aspects of a practice does not, in and of itself, translate into appreciation or utter joy; the choice, however, to actively to turn attention to the small things, the often easily overlooked, becomes a way to find the extraordinary in the ordinary. August is here, a major vacation month in our area, and we notice traffic on the roads is light, since many of us are out of town. Traveling, for business or for pleasure, is exciting but can be draining as well, especially air travel. I wanted to share a few tips on how to make the experience a bit better and arrive at your destination if not replenished at least not too wiped out. Make good food choices to nourish your system before your leave. There are better options than McDonald’s or Cinnabon in airports; fuel up with healthy foods to maintain steady blood sugar and to boost immunity. During your trip, try to eat more like a vegetarian so not to disrupt your digestion. Hydrate, hydrate, hydrate! Drink plenty of water before and during your flight, and avoid coffee and alcohol. Move around as much as you can. If you practice yoga, squeeze a short practice in before you head to the airport or get into your car. And if you are flying, there are now many airports with designated yoga rooms where you can go if you have a connecting flight or you get to the airport early enough. Wishing you a wonderful summer month, whether you are going on a trip of a lifetime, or dropping your child off in college. We look forward to seeing you at IPY, where you are always welcomed!